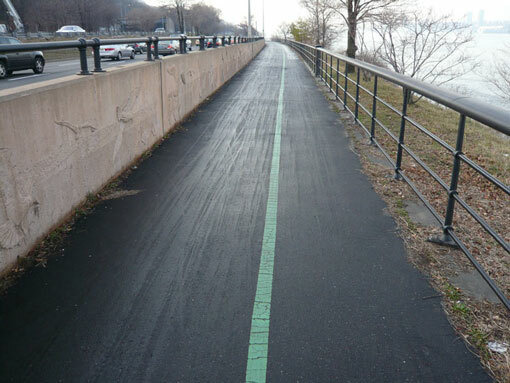 Hudson River Greenway near 125th Street. morning the pavement had a thin layer of moisture that counted the bicycles." Hey, I can see mine! It’s right there, 28th from the left. I recognize the tread pattern, and the little issue with my un-true wheel. You should get that rear wheel fixed, Curmudgeon, before its diminished braking ability causes an accident with a motorist. Be your own safety advocate! Thanks for sharing the fantastic picture Lars. Observational research is a cornerstone of good urban design. The trace elements you recorded are not only a living phenomena they are a reminder that we bicycle commuters are not alone or insignificant. While the horns, idling and jockeying of automobile congestion creates a constant reminder of their insolvency, the growing legions of bicycle commuters tread lightly and quietly on our fair city. yup, harry, and, to merely underscore your statement, leave such a small environmmental footprint! Now if we could just get rid of those four-wheeled things over on the left. Interesting how much colder it was on the Cherry Walk with the wind blowing off the river than anywhere else on the bike path this morning. Draw pictures of bicycles in an artist’s studio. This workshop focuses on gesture, composition and basic bicycle anatomy. Participants draw bicycles from observation. All levels welcome. Class size limited to 10 participants. Basic materials provided. Come learn the basics of bicycle repair from female mechanics at Time’s Up’s workshop designed by and for women. You will learn on Time’s Up’s bicycles (you can apply what you’ve learned to your own bike on Thursday nights). No previous experience with bicycle repair required — or expected. Come learn the basics of bicycle repair from female mechanics at our workshop designed by and for women. You will learn on Time’s Up’s bicycles (you can apply what you’ve learned to your own bike on Thursday nights). No previous experience with bicycle repair required — or expected.